(CNN) -- If Washington wants health care reform with bipartisan support, experts say consider what former Republican presidential candidate Mitt Romney accomplished as governor in Democratic Massachusetts. Mitt Romney says the president must have bipartisanship in order to get quality health care reform. 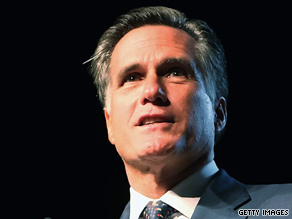 "You don't have to have a public option," Romney said. "You don't have to have the government getting into the insurance business to make it work." Three years after enacting its own version of reform, Massachusetts now has near-universal coverage. Taxpayer watchdogs say it's affordable. "There is this widespread assumption, that is treated as fact, that it's breaking the bank in Massachusetts ... it's not breaking the bank at all." said Michael Widmer of Massachusetts Taxpayers Foundation. And health care experts say it's popular. "Seven in 10 people in the state support the program, and no more than one in 10 would repeal it." said Robert Blendon with the Harvard University School of Public Health. Unlike Democratic proposals that would give Americans the choice of joining a government-run health care plan, Massachusetts has no public option. Instead, people in the state are required to buy private insurance, and the poor get subsidies. The reform created the Commonwealth Health Insurance Connector Authority, which is similar to a health insurance exchange. Nicknamed "Connector," its purpose, according to the state, is to connect individuals and small businesses statewide to affordable insurance plans. The program reviews "existing health insurance coverage plans in the marketplace" and gives "certain plans the Connector 'seal of approval.' Plans offered through the Connector will not be subject to minimum contribution and participation rules," according to the state government's Web site. And under the 2006 legislation, there are several requirements for insurance companies. Limits on age restrictions, which means what is charged for an older individual cannot be more than double what is charged the youngest. When asked if he'd support Obama's health care reform plan if it doesn't include a public option, Romney said that it "depends on what's in the rest of the bill." The Massachusetts model, however, does have its problems. Experts say it doesn't control rising health care costs -- something Romney insisted must be tackled on a national level. Michael Tanner, the director of health and welfare studies at the libertarian Cato Institute, said that the Romney care program plan costs taxpayers a "great deal of money." "Originally, the plan was projected to cost $1.8 billion this year. Now it is expected to exceed those estimates by $150 million," he said in 2008. "Over the next 10 years, projections suggest that Romney Care will cost about $2 billion more than was budgeted." He added: "And the cost to Massachusetts taxpayers could be even higher because new federal rules could deprive the state of $100 million per year in Medicaid money that the state planned to use to help finance the program." At a GOP presidential debate at Reagan Library in June 2008, Romney defended his program. "I'm the only one that got the job done. I got health insurance for all our citizens. We had 460,000 people without insurance. We got 300 of them -- 300,000 of them -- signed up for insurance now. I'm proud of what we accomplished," he said at the time. Meanwhile, Romney says Democrats have only themselves to blame for those rowdy town hall meetings that have sometimes been reduced to shouting matches and even violence. "I think any time you're dealing with people's health care and their ability to choose their doctor, you're going to find people responding very emotionally," he said. As for former Alaska Gov. Sarah Palin's now debunked claim that reform would lead to so-called "death panels," Romney said "I'm not going to tell people what they can and cannot talk about." Still, Romney does warn the president that bipartisanship is the only road to health care reform. "I think the right process for the president to pursue on a subject that is so emotional, so important to all Americans, is to go through the lengthy process of working on a bipartisan basis," he said. "He promised that." Democratic sources said Tuesday that the White House might resort to passing a Democratic-only bill without bipartisan support. The White House later said Wednesday that the president was hopeful bipartisan talks would continue if Republicans continue to help Democrats devise a comprehensive plan. Democrats, however, may run into problems. A Quinnipiac University poll shows the American public is wary of a Democratic-only bill. When asked if that's the right approach, 59 percent said they were opposed, while 36 percent said yes. The poll had a margin of error of plus or minus 2 percentage points. But it's not all good news for Republicans. A new NBC News poll shows only 21 percent approve of the Republican Party's handling of health care, while 62 percent disapprove. In contrast, 41 percent approve of Obama's handling of the issue, while 47 percent disapprove. The NBC News poll was conducted August 15-17, with 805 adults questioned by telephone. The survey's sampling error is plus or minus 3.5 percentage points.